#177: I Am Not Second | mark Joseph "young"
This is mark Joseph “young” blog entry #177, on the subject of I Am Not Second. I am not the boss in my family. I don’t know how I lost it; I don’t know if I ever had it. But I’ve seen the boss’s job, and I don’t want it. I am not the boss in my house, either. The boss tells me what I need to do and when I need to do it, and anything I think is important I do on my own time. I’d like to tell you that I am second, but I don’t think that’s true. I think actually the dog is second; in any case, I’m pretty sure he outranks me. If he wants to go outside in the middle of the night, he wakes me so I can let him outside. If somehow his whining and wheezing does not get a response from me, he wakes the boss–and the boss wakes me, and tells me to let him outside, usually with the words, “You’re not going to make me get up and take him out, are you?” Thus it is clear that the dog outranks me and gets to decide when I am going to give up my sleep so he can go out. This is the same dog of which I said, “I don’t want a dog,” and “you can have a dog as long as he is never my problem.” He is also the same dog that I feed and water every day, and let out several times a day, and deal with whenever he is a problem for someone else. So I am not second; both the boss and the dog rank above me. There are almost certainly other people who rank above me, but I don’t really want to try to enumerate them at the moment. It sometimes (read “often”) feels like everyone in the world outranks me; I am pretty far from second. This tirade was inspired by what is apparently a fairly successful ministry under the name “I am second.” I expect it’s the best Christian catchphrase since “What would Jesus do?” I get it. It’s saying I need to take myself out of first place and put Jesus in first place; that puts me second. The thing is, it doesn’t, really–or it shouldn’t. I had a bad reaction to it the first time I heard it, and my wife had the same bad reaction quite independently of me. I am not second, and I am not supposed to be second. Whoever might will to be first of you will be slave of all. I am not called to be second; I am called to be last. 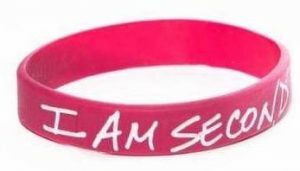 The problem with the formulation “I am second” is that it might state my relationship to God correctly, but it misstates my relationship to the dog. O.K., maybe not to the dog–but to everyone else, certainly. The hierarchy in my life is not supposed to be Christ, me, everyone else. It’s supposed to be Christ, everyone else, me. I am not second; I am last. I am sure that it is a wonderful ministry doing wonderful things, and I do not mean to denigrate it. However, I feel that a significant point has been missed here. Don’t put yourself second. There are a lot of other people who should be above you in the hierarchy. And remember, it is not a single fixed universal hierarchy. Jesus is always first for all of us, if we have it right. In the hierarchy that governs my life, you–all of you, each of you–outrank me; but in the hierarchy that governs your life, I, along with the rest of us, outrank you. We were called to serve each other, to put everyone else above ourselves, to be a long distance from second place in our own lives. Don’t put yourself second, either.